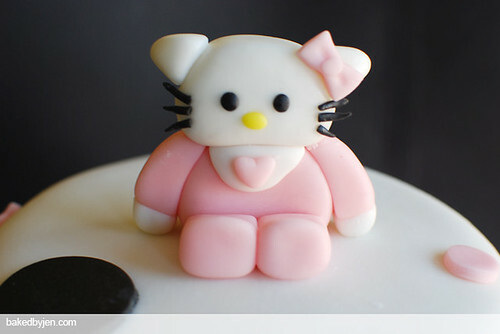 For those following my progress, I've made a baby shower cake before and a Hello Kitty cake, not once but twice before. 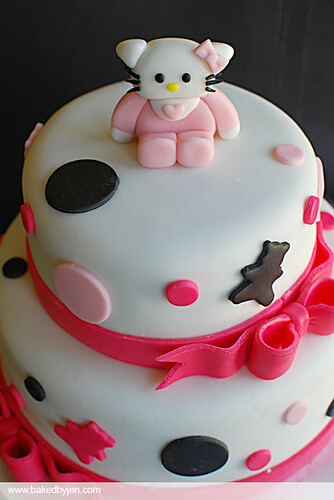 So, it couldn't be long before I made a combo of the two, a Hello Kitty baby shower cake! I had a lot of fun decorating this cake. I absolutely love Pink Cake Box's work. So, this was definitely inspired by their baby shower cakes; especially the ones with the cute bows! I did make it my own by handcrafting a baby Hello Kitty topper for my friend (the receipient) who loves Hello Kitty. I also added a bunch of teddy bear cutouts onto the cake. The tiers were made from carrot and chocolate cakes with cream cheese frosting and peanut butter frosting. 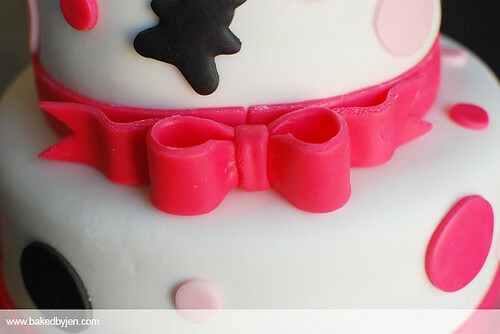 Everything was covered and decorated with homemade marshmallow fondant. I'm sharing the peanut butter frosting as it was ridiculously good for something I just threw together because I was too lazy to go to the store to buy more butter and powdered sugar. Cream together the peanut butter, butter, and cream cheese until smooth. Slowly mix in the powdered sugar. Scrape the bowl down often. Add the milk. Beat until light and fluffy. That is awesome, Jen! I love how chic yet fun it looks! Awesome! Jen, that is too cute! Love the shade of pink you chose! And of course, would love to try your peanut butter frosting!